Slav Simanic, a talented guitarist and composer from Toronto, Canada, has recently released Water Of Life, a mostly instrumental CD which advances a powerful Christian message through its occasional use of spoken word quotes taken from the Bible. The music on Water Of Life is intense, aggresive hard rock/metal and displays both rich arrangements and a dedication to the sound of overdriven guitar riffs played with precision and dynamics. Simanic is a fierce guitar player, and his debut recording proves that high-intensity shred can be delivered with taste, melody and a passion for musical quality. It's even tough to pick favorite tracks from Water Of Life, since each piece offers something new - in short, a great CD from start to finish. Born in Smederevo, Yugoslavia, Slav started to play guitar at the age of 12, receiving classical training while in school. In the early '90s, he started an instrumental rock band called "Bride" - the band played clubs, guitar festivals and received radio airplay. Slav then relocated to Canada in 1994 and began teaching guitar at the New Conservatory of Music in Toronto, and he operates his own teaching and recording business, Bride Music Studio. Slav has several goals for his original music: to celebrate the Lord, to spread positive Christian messages and to encourage young musicians to abstain from drug use. 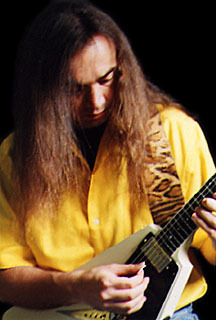 Simanic is constantly exploring new styles and techniques to improve his playing and to share his discoveries with his students. His future plans are to upgrade his recording studio, continue to write and record his music, and collaborate with other musicians.